1. It must be the right length. The X-IT Ladder should get you to within 2' of the ground for safe escape. To measure for your ladder drop a string out the window until it touches the ground, mark the string at the window sill, then pull the string inside to measure it. 2. It must fit the window sill. X-IT Ladders are designed for ALL window/wall thicknesses by securing to the wall structure beneath the window sill. Other emergency ladders are limited to window/wall thicknesses between 10" to 12". 3. It must be approved. X-IT Ladders exceed ASTM Standard F2175. UL participates in ASTM Standard F2175. 4. It must perform. 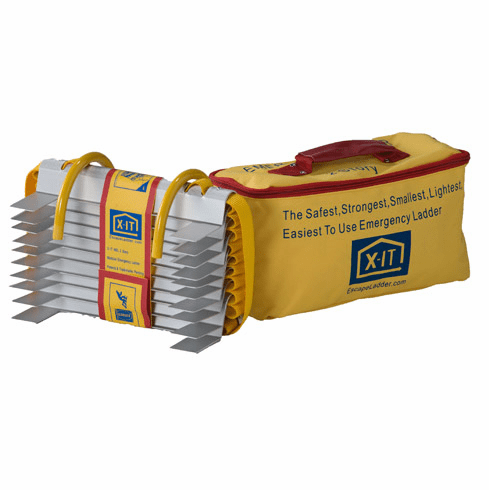 The X-IT Ladder was independently tested by Fox News and proven to be the safest, smallest, lightest, easiest and quickest to use. 5. It must be re-usable. X-IT Ladders are re-usable. We encourage safe practice. 6. It must be the best emergency fire escape ladder. The X-IT Ladder has won many awards and is part of the New York Museum of Modern Art. Major manufacturers have stopped producing chain rail escape ladders and plastic step escape ladders because they are bulky, heavy, weak, known to tangle, and are slow to deploy.